Important three points up for grabs on Monday evening. I can't help but be distracted by the game that follows. It's all about the North London Derby. It always is. Arsenal's downfall vastly over-exaggerated thanks to the fallacy that perceives them as a club under-performing. They are doing pretty well all things considered. Perhaps they are (under-performing) in terms of gate receipt revenue and the fact they do spend big on players or wages. As it stands nobody has been able to retain a challenge to Manchester United's dogged consistency and the likes of Chelsea and Manchester City are now first port of call for so many players that might have (in the past) ended up at the Emirates. Arsenal have their failings. Ask those who frequent their games (mostly at home) and they'll tell you they can't defend with any collective strength and concentration. They can still attack and have several players capable of match-winning moments. The fact they just about crawled past a poor Aston Villa side on Saturday (too harsh?) also tells you that for all talk of crisis, they are more than good enough for the top four. Because just about crawling past teams is a necessity along with the chest-thumping bravado and easy victories. Their luck has yet to run out. That stadium of theirs that enjoys the odd empty seat and occasional bin bag will anchor them to the upper echelons of football for a long long time. Still, they remain a club obsessed with their past and perhaps for all the talk of 'forever in their shadow' it's the shadow of the invincibles cast upon themselves that clouds their objectives from one season to the next. They're a good side, not a great side and definitely nowhere near being a title challenging side. But thanks to Arsene Wenger they can still retain that invisible yet profitable trophy of qualification to the Champions League, season in and season out. That same trophy that serves to pay off debt and stretch ambitions but never quite deliver the tin pots. They routinely get beaten on the continent. But that's hardly a bad thing. I wouldn't mind a spanking from Barcelona or Bayern Munich. We've all got our kinks. Sure, every supporter wants the very best for their club but at the same time you should know and accept the reality of your predicament and try and enjoy it for what it is. Some of the reaction is petulant and spoilt and inconsistent. We've already seen an element like that amongst our own. Sense of entitlement membership is universal. All the complaining and bemoaning and the Wenger in out in out confusion serves to display an erratic mind-set that just tells everyone they're a club desperately attempting to be two levels above the level they're at currently. Again, nothing wrong with supporters wanting silverware but this is no longer the mid-90s, it's no longer the early 2000s. The playing field is far more open now. Their best players look to move on, for the love of money and physical trophies. No different to most clubs that are top tier but aren't quite bullish enough to squeeze in for a share of the wealth (not just the turnstile profit). You do what you have to do to push onwards. Arsenal's transition is hardly a difficult one compared to teams below them. Aside from some fans demanding a degree of quality that is beyond them at the moment and finding everything else unacceptable. Is it really that unacceptable when you compare their squad to older ones or ones belonging to other clubs above them? And more so a transition clouded by that untenable expectancy where they still harbour long lost dreams. It's a difficult one for them because they won't let go. They won't move on. Or rather (from their perspective) their club/coach won't move on. It's still staggering when some aim their despondency at Wenger who is basically the personification, the creator, of every player and supporter at the club. He is Arsenal. And now the monster has turned against Frankenstein. Wenger reinvented a club with no identifiable vibrancy to one to reflect his own methodology and philosophy. No surprise that the moment Wenger's influence degrades/when the football landscape changes, so does the philosophy and those that follow it. Testament to the players Arsenal had and lost. But all this is their own personal problem. I'm just an outsider on the edge of marshlands I'd rather not step into and I'm only attempting to bring a balanced view point (just a touch biased perhaps) from where I'm standing as I'm sure Arsenal fans will have far stronger opinions on their internal politics and Wenger's current struggles to adapt to attaining the levels staring back at him from above. Manchester United and City currently occupying the two positions everyone else desires. Modern football is rotten when you're having to pay £90 for a ticket, excluding travel, food and drink. Seems there's a sizeable majority of their fans who are fully paid consumers now, a consequence of that success and evolution we all seem to be overly obsessed with (whilst Swansea thrash Bradford for one of those tin pots and Bradford don't stop singing for the love for the shirt). Don't laugh too hard at the consumer tag, that might be us in a few years time. We've already had previews (cast your mind back to the first few games of the season and the depressing rhetoric that accompanied any given game at the Lane). The only relevant perspective is one of a purely footballing matter. It's the fact that once again we find ourselves just above Arsenal and competing for fourth place; a purely financial and slow brooding economic honour that won't be recounted in the history books but might work towards a grand prize in terms of competitive edge. 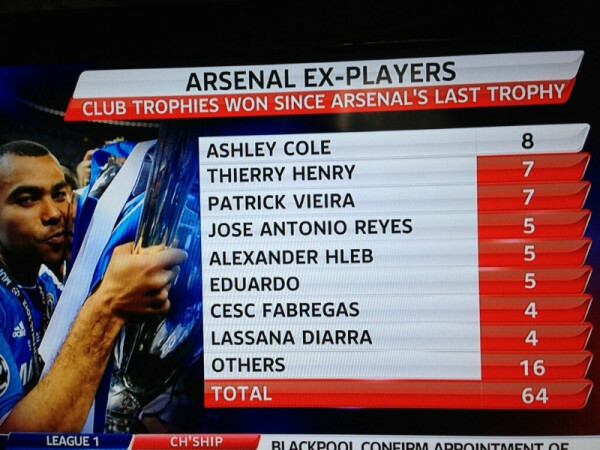 It's that invisible trophy that hasn't made a blind bit of difference to them lot. Eight years of stasis is probably why they're miserable. Yet another warning not to laugh too hard as that's eight years of CL money that hasn't progressed them further. Like a hot woman, teasing and playing and never letting you see her bedroom. All the cold showers will leave even the most hardened, shrivelled and frustrated. And in that same amount of time (the fabled eight years) we've only had the one day out* (although that was some day and one we won't ever forget). We smiled with joy when we beat Chelsea. Arsenal, in the same competition, shed tears in their recent final. Further testament to those times and the undeniable fact they've changed. *Two days, not forgetting the defeat against United, but the single day of glory. Tottenham, for the most part this season, have actually over-achieved. Yet even though our problems (with playing squad) should be seen as detrimental we've turned all negatives to positives - be it by the skin of our teeth on occasions. We lost the fundamental parts of our midfield in the summer and have had to make do with key players out injured. Yet we've stuck at it and displayed plenty of resolve, if not the same swagger of recent years. Maybe we haven't over-achieved. Maybe with the players we do have at our disposal our position is relative to the rest of the competition out there. Begs the question how good we might be if we speculated a little more (although everyone will look to improve again in the summer). Arguably, the most frustrating thing is - we always allow Arsenal to get the better of us (in recent times where this 4th spot battle has consumed both clubs search for silverware). Last season we gave it all away. Imploding and thus amplifying Arsenal's grit and desire to dig away at the points gap. Our defeat earlier this season, another implosion (of a more individualistic nature) and a performance that saw us well beaten, even though the football we played painted a different picture (be it one that doesn't account for points or bragging rights). It was a better 5-2 defeat than the first one. Only in the world of Tottenham could that be understood and make any sense. It's tiresome that we make their efforts against us so comfortable and I implore Tottenham to fight it out with every remaining opposition and see who has the balls to get ahead without the excuse that 'someone else f**ked it up'. I don't want to beat teams that have excuses the same way I hate to admit we had excuses for defeats in the past. Stupid capitulations (regardless of some suggesting its an inbuilt trait) deflect. I'f we're going to be beaten I'd rather just be beaten, pound for pound, than lose myself in the what if scenarios. Yet they continue to 'just about do it' every season with next season always the season they'll improve tenfold, but don't, but still just about get away with it. Not too dissimilar to us except we're almost doing it and just need to find that end of season consistency to retain it at the death. We have them on the ropes all season, then they win by TKO. Last season, we lost at the Emirates and it was the catalyst. For them. For us it was the beginning of the end. This season it was the catalyst again. For us. Our reaction was to brush it off, man up and get on with it. Strength from coach and players. The game at White Hart Lane might well be another catalyst that fuels belief for the run-in or crushes hopes. For me, it's simply about the greatest rivalry in football. One that is based on footballing reasons and not religion or politics. For the ninety or so minutes, there is no top four chase, there is no past or future. Just the present day. I want us to smash them to bits. Whatever happens after that is another day and I'll concern myself with the bigger picture in the aftermath. Their luck has yet to run out. Rather than waiting for that day to happen, step up and take it away from them. As for Monday evening. It's the starter. An olive on a stick with a few slices of ham. I like olives. Don't choke on the olive Spurs because you'll only go and ruin the main course.